Mangaluru, Karnataka, 21 December 2017 – The Akshaya Patra Foundation in association with GT Foundation & Diya Systems Pvt.Ltd announced the foundation stone laying ceremony to build a mega kitchen in Mangaluru. This kitchen will serve mid-day meals to over 50,000 children from the year 2019. The announcement was made during a press conference on 21 December, 2017, chaired by Shri Karunya Sagar Dasa – President, Mangaluru, Mrs Vandana Tilak – CEO - USA, Mr Sundeep Talwar – CMO, The Akshaya Patra Foundation and Shri Dr V Ravichandran – CEO Diya Systems, Mangalore Pvt. Ltd.
A ‘Bhoomi Puja’ was held on 22 December, 2017 along with the lighting of the lamp ceremony to usher an auspicious start to the undertaking. 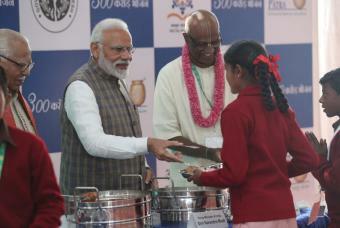 The ceremony was organised by The Akshaya Patra Foundation at the new kitchen premises in Kodman village, Benjanapadavu (behind Canara Engineering College). 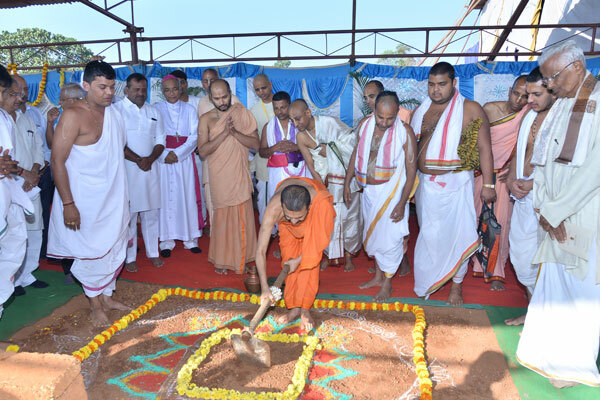 Among the eminent dignitaries present at the event were Shri Shri Vidyadheesha Threertha Swamiji - Srimad Jagadguru Madwacharya Mahasamsthanam, Sri Palimaru Matha Udupi, Shri Shri Ishapriya Theertha Swamiji – Junior Seer of Shri Adamaru Matha, Udupi, Rev. Dr. Aloysius Paul D’Souza - Bishop of Mangaluru Diocese, Bishop’s House, Kodialbail, Mangaluru, Shri Chanchalapathi Dasa - Vice-Chairman, The Akshaya Patra Foundation, Mr Shridhar Venkat – CEO, The Akshaya Patra Foundation. Yenepoya University, Mangaluru, Smt Meenakshi Shantigodu - President, Zilla Panchayat, Capt. Ganesh Karnik- MLC and Opposition Chief Whip,Karnataka Legislative Council, Shri J. R. Lobo - MLA, Mangaluru South Constituency, Shri B.A. Mohiuddin Bava - MLA, Mangaluru North Constituency, Shri Vinay Kumar Sorake- Ex. Minister for Urban Development, GoK, Shri K Chandrahasa Karkera – President, Taluk Panchayat, Bantawala Taluk, D.K. Smt Kavitha Sanil - Mayor, Mangaluru, Shri Sasikanth Senthil S - IAS, Deputy Commissioner, Mangaluru, Shri Ganesh Suvarna - Taluk Panchayat Member – Thumbe Grama, Shri Ravindra Kambli – Zilla Panchayat Member – Pudu Kshetra, Shri Sathish Naiga Kodman Kodi – President - Mera Majalu Grama Panchayat. The dignitaries present expressed their happiness for being a part of an initiative which is addressing the National issue to eradicate the classroom hunger in India. They congratulated The Akshaya Patra Foundation for successfully completing 17 years of implementing the school lunch programme and also appreciated GT Foundation, Diya Systems Pvt. Ltd. for partnering with the foundation to boost and promote education with delicious, healthy meals across government schools in Dakshina Kannada district. The upcoming mega kitchen will be set up with adherence to all good manufacturing practices, use of technology and innovation. About GT Foundation and Diya Systems (Mangalore) Pvt. Ltd.
GT Foundation was established in the year 2004 and administers help through a wide spectrum of programs catering to the financial requirements of individuals across Health, Education and Cultural domains. The Mission of GT Foundation is to provide economically challenged families access to quality health services, educational assistance, employment opportunities to promote art and culture to improve the social, cultural, and economic foundation of our society. The Foundation has independently and also in association with the Rotary Club of Mangalore, built orphanages, schools, computer training facilities and also participated in a wide variety of social entrepreneurship and awareness projects. It has been reaching thousands of orphan children, the elderly who reside in old age homes and the needy, by providing free food, necessary care and financial aid. Diya Systems (Mangalore) Pvt. Ltd. headquartered in Louisville, KY, USA with offices in Palo Alto-CA and a development centre in Mangalore, India. Diya Systems provides turnkey technology and outsourcing solutions to small, medium, and enterprise-sized businesses nationwide. Diya Systems is the largest IT Company located in Mangalore, Karnataka and the recipient of several State and International Awards. Diya Systems provides custom application development services, customer and technical support, business process outsourcing, website development, IT infrastructure services and more.